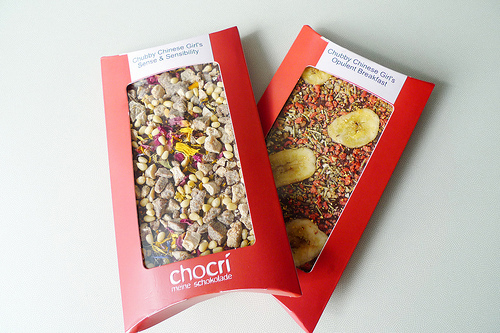 Chocri: Customize and name your chocolate bars! 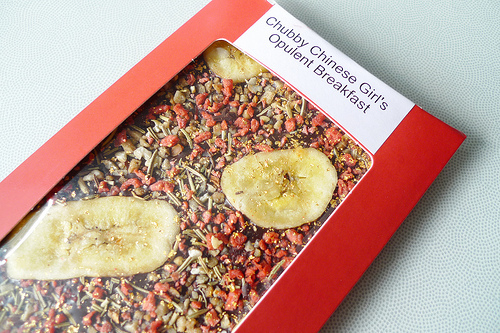 A while back, the folks at Chocri let this Chubby customize and name her own chocolate bars. First pick the type of chocolate (dark for me) and then you get a wide variety of add ons that were super fun and cool. 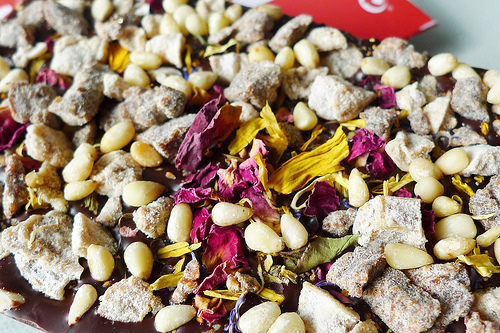 Anything from nuts to dry flowers and fruits, spices, grains, confections and even real gold flakes! Trust me, you’ll have a great time customizing your very own! This had a dark chocolate base, which is smooth and semi sweet (love, love, love). 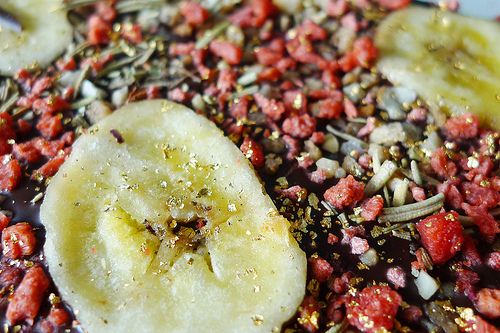 To that I added ingredients that would mimic a regular breakfast, things like banana chips, imitation bacon, hazelnut brittle, spiced it up with some rosemary and the real gold flakes for that opulent touch. I liked the crunch and melt in your mouth dark chocolate that was happening, but the imitation bacon threw a weird spin, it had a very superficial flavor and texture. I wished they were real bacon bits, i know… i should of known it’s imitation but hey! I’m a dreamer and was hoping for the best. 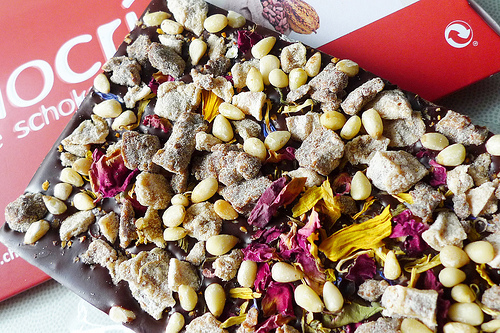 The hazelnut brittle played in the background as scents of rosemary perfumed the bar. The gold flakes didn’t add any flavor, but a nice shimmer you don’t usually find in a chocolate bar. I enjoyed my Opulent Breakfast Chocolate bar, but ext time I order, I would have to omit the fake bacon. *EDIT (12/22/10): I was just told by Carmen from Chocri that they no longer use imitation bacon!!! only real bacon bits now!!! awesome! so I would stet the above statement and order it EXACTLY the same way next time. This also had that semi-sweet rich dark chocolate base. It has a very girly theme, hence the name. 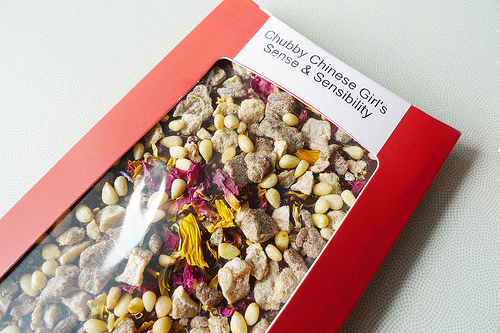 Beautiful flower mix, fragrant pine nuts with hints of orange pepper plus sweet and chewy pieces of fig and pear. I wanted to experiment with adding spices to my chocolate. I knew the nuts and dried fruit bits would be perfect, but since I rarely find pine nuts in my chocolate I thought it would be fun. Pine nuts have that distinct aroma I enjoy. The flower were purely for looks, it adds a little romantic scene. The orange pepper was quite unique and an acquired addition. I’m glad I played around, now I know, I don’t like pepper in my chocolate. 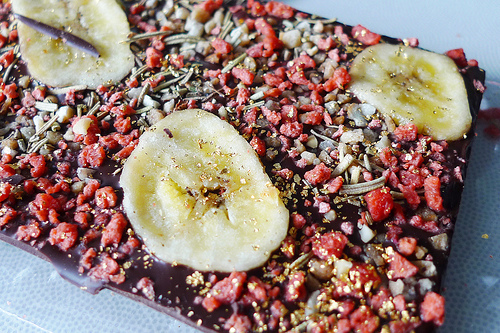 But overall it’s an eye candy bar that’s also a treat for your palate. These are great for the chocolate lovers in your life, sweet at any occasion. Or just be like me and create them as your own little treat.